First of all, Happy Easter everyone! Whether religious or not, I hope we can all at least appreciate the chocolate festivities of this time of year. Though, sadly, I have been chocolate-less for some time now – it’s a trauma I’ll just have to live with. Anyway! For me, Easter is always synonymous with my discovery of the Star Wars expanded universe – many many years ago, a schoolfriend pointed me in the direction of Heir to the Empire, and I have not looked back since. It’s hard to believe now, but for a long time my love of Star Wars was confined to just the three movies, and I had no idea of this whole load of accompanying literature! But twas over the Easter break that I first read Mr Zahn’s absolutely amazing work, followed swiftly by the graphic novel Crimson Empire, which was the sum of our school library’s Star Wars collection, but these two books launched me on a career from which I have not had a moment’s regret! 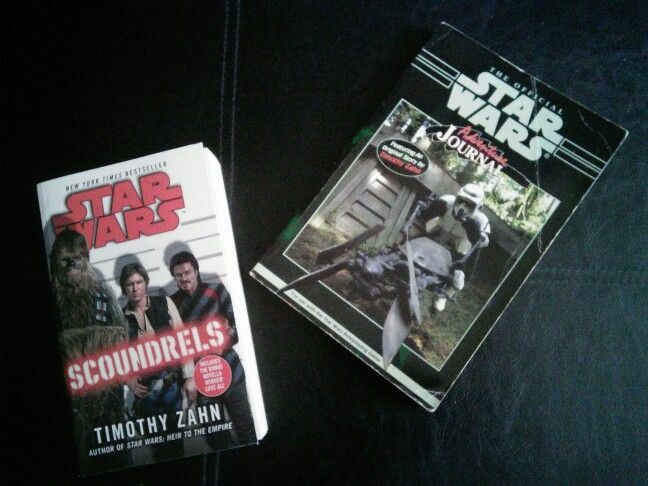 This Easter, I read another Timothy Zahn novel, Scoundrels. Released last year, I’ve taken so long to read it for a variety of reasons, not least being that I dislike reading books in hardback, so always wait for the paperback release before sampling them (I did once request the local library order in Star by Star upon its release, because I just couldn’t wait for that to come out, but otherwise, yeah…) Scoundrels is set between A New Hope and The Empire Strikes Back, and is really a book that’s focused on Han Solo (as the cover might have led you to believe!) Han isn’t quite in with the Rebel Alliance yet, so is still off around the galaxy smuggling and getting up to all sorts of shenanigans on the fringe of galactic society, and he still hasn’t paid off Jabba the Hutt. The book was publicised as “Oceans 11 meets Star Wars”, and that’s a pretty close description, really. Han is recruited to break into a vault for a guy who has had some money stolen, and recruits a team to help him do it. If you’re wondering how Zahn manages to spin this out to cover nearly 450 pages of story, then you’re obviously not familiar with the man’s work! A whole raft of colourful characters, some old favourites and some new blood, are assembled, and the criminal organisation Black Sun are thrown in along with Imperial Intelligence – if you haven’t read this novel yet, you’re in for a really fun experience! I really liked seeing the nods to Zahn’s previous work, but the new characters he has come up with are so well-done that I was racking my brains for the first few chapters trying to think if they’ve come up before – they mesh that well with the whole. But this is the guy who gave us Thrawn, Mara Jade and Talon Karrde, so I’m not really surprised there. Of all the newbies, Bink Kitik and Rachele Ree were probably the two most interesting, and the two I’d most like to see more of. Fortunately for us, then, Zahn has written two other short stories that feature Bink, one of which is handily included in the back of the paperback release! Something I was really concerned about with this book was Lando’s inclusion. In case you don’t remember, there is some bad blood between Han and Lando, as suggested in Empire Strikes Back (“You’ve got a lotta guts coming here, after what you pulled”, remember? ), which is explained in the 1998 novel Rebel Dawn (part three of the excellent Han Solo trilogy, which I can recommend to anyone if you can pick it up!) by Han recruiting Lando, among some other smugglers, for a similar sort of heist-job that goes sour on all the scoundrels involved, Han included. Lando blamed him for it, and smacked him in the mouth, telling him he never wanted to see him again. This has, for years, been the accepted reason for Lando’s comment, but now we have a story with the two of them set between these events, and I was concerned that it wouldn’t pan out. Well, it does – kinda. 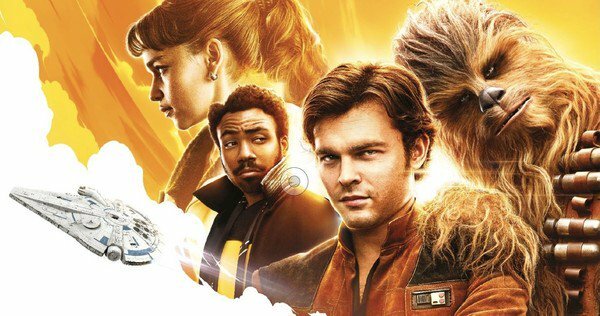 Zahn really captures the changed dynamic in their friendship since the Han Solo Trilogy, but unfortunately I felt it seemed to resolve the tension too much for the events of Empire to feel right. Instead, I suppose I would have preferred it if Lando had been left out altogether, but then how would you have a book called Scoundrels without him? Hm. Zahn does a great job, but it does somehow feel unnecessary. Something else that I was a bit baffled by was the very end, which I won’t spoil here. Suffice it to say there was a surprise twist, but I felt it was completely redundant, and done more for fan-appeasement than for the demands of the story. If you’ve read the book, I’d love to know what other people think of this! In addition to Scoundrels, I’ve also read some shorter fiction by Zahn, including one of the aforementioned short stories – Winner Lose All. This is a great prequel to Scoundrels, featuring Lando in a high-stakes sabacc game, and serves as an introduction to three of the new characters, including Bink. I kinda like Lando a lot, and feel he’s been terribly underused by the expanded universe. The L Neil Smith trilogy is just apalling, but any other time I get to read about the dashing gambler is usually good. Having his own short story here is just great – there are no galaxy-spanning massive events taking place, it’s just a good piece of fun fiction that is written really well, with some really compelling characters. Hopefully we’ll see more of Bink and Tavia soon, anyway! The other short story I read this Easter was Command Decision, which was originally published in the Star Wars Adventure Journal in 1994, a now-defunct publication for a now-defunct Role Playing Game line from a now-defunct publisher. Sigh. I’ll probably wax lyrical about the Role Playing Game in another blog, but for now, suffice it to say that it was awesome, and has some really awesome stuff in it. Including short fiction! Zahn wrote four stories for the Journal’s 15-issue run, if I remember correctly, and Command Decision appeared in #11. It’s basically a short piece featuring Grand Admiral Thrawn, but uses some characters that were taken up again in his later work – including a whole other species that wasn’t properly investigated until 2005! It’s a good bit of backstory to the blue-skinned, red-eyed Grand Admiral, and I enjoyed it very much! So I hope you’ve all had a tremendous Easter, whatever you’ve been up to, and I’ll be back again soon with more awesome stuff! Author spalanzPosted on April 21, 2014 April 21, 2014 Categories Star Wars novelsTags Easter, Han Solo, Lando Calrissian, novels, Scoundrels, Star Wars, Timothy Zahn, Winner Lose AllLeave a comment on Easter!